A home hero winner, some inclement weather, and bravery which would make the big balls from Total Wipeout feel inadequate – the British GP had a lot to offer in 2016. As testing in Silverstone gets under way, let’s reflect on a very entertaining British Grand Prix. It’s the British Badgerometer! Poor old Jolyon Palmer just cannot catch a break. After good pace in the three Practice sessions, the 2014 GP2 Champion couldn’t get his tyres up to temperature and was knocked out in the first session of Qualifying, leaving him on the ninth row of the grid with Compatriot Jenson Button – not exactly ideal for the home race of either driver. To add insult to injury, when he pitted for Slick tyres as the track surface improved, he was released without his right-rear tyre. Then, to add a your mum joke to insult to injury, he was also given a Stop/Go Penalty for the unsafe release. That left him a lap down, and after several laps of blue flags, he retired as a precaution with a gearbox worry. Along with both Saubers, Esteban Gutierrez and Rio Haryanto, Palmer is one of the few drivers yet to score a point in 2016; the Renault’s poor downforce seemingly masking his actual abilities. In fact, his best performance of the year so far has been the very first race in Australia, where he finished 11th, but aside from races where he’s come into difficulties, he’s finished just outside the points, finishing thirteenth in Russia and Spain, and twelfth in Austria. Hopefully, J Palmer Jr will have some luck come his way later in the season, or he may be ousted from the team by Esteban Ocon. Saturday’s Qualifying session was so action-packed that we commissioned a whole new article just to keep on top of things. Nothing personified the barmy session better than Jenson Button’s predicament. After posting a lap time he headed back to the pits, only to be relegated to 17th place by Daniil Kvyat and Kevin Magnussen. It transpired that Magnussen was to have his lap time deleted for going over the white lines at Copse corner, so he jumped back in his car, but as it turned out, it was not Magnussen’s fastest lap that was deleted. So, the Briton really was out, at his home race as well. He made up a very disappointed ninth row of the grid with Jolyon Palmer. With a rain shower before the race, Silverstone had a hearty layer of water on most parts of the circuit. This was cleared early on by the wet and intermediate tyre compounds, but one part of the track remained stubborn in retaining its moisture – the fearsome Abbey right-hander. There was barely a driver who didn’t have an off-track excursion because of its sodden tarmac. Both Manor drivers succumbed to the damp kink; Rio Haryanto sliding into the barriers, with Pascal Wehrlein doing so earlier on, just as the Safety Car came in. Where, line, Wehrlein? The Manor driver skids out of the race. Octane Photographic. He just keeps on setting a new precedent, doesn’t he. There are few superlatives in the dictionary untouched by the career of young Max Verstappen; if there’s a record for youngest ‘something’, it’s probably his. And though we’re only ten races into the season, we’re pretty certain you can add ‘Overtake of the season’ to his bustling CV after an unbelievable move on Nico Rosberg on the exit of Becketts going into Chapel. Even Martin Brundle, who has seen it all, could only muster “What?” as he looked on in disbelief. It was bold, brave, and brilliant, and though the Red Bull couldn’t quite muster the speed to hold back the Mercedes for the whole race, the Dutchman gave it his best shot, succumbing after 22 laps of pressure. Oh dear. It’s happened again. That confounding and overzealous rule brought in last year to prevent ‘coaching of the driver’ over team radio has claimed its next victim; Rosberg. Rosberg was told to reset to “chassis driver default one“, and to shift straight through seventh gear; but it was the latter comment, not telling him how to fix the problem that resulted in the issue. However, Mercedes made the right call here. With Rosberg stuck in seventh gear (The Friends theme tune is in my head too, I assure you) coming into Vale, Peter Bonnington faced a tough choice – let him carry on in seventh and surely ruin the gearbox, or incur a 10-second penalty. When you put it like that – gain 15 points, or score none and get a grid penalty next week – it really is a no-brainer. While the penalty might be seen as just, it really begs the question – why must the rules be so confusing? If rules have to be ‘interpreted’ rather than just adhered to, they need re-working. That’s just how instructions ought to work. 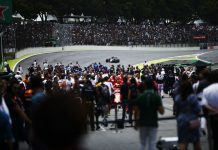 Toto Wolff spoke fervently about a need to address the over-complex rules after the race, so we’ll have to wait and see what happens to that end. Mercedes considered appealing, but decided there was little point. It’s messy, and after a great race, it leaves a bit of a bad taste in the mouth. The bottom line is, though, that Rosberg and Hamilton are now separated by one point in the championship fight. How exciting! Next, we move on to Budapest, which is incredibly the ONLY track Mercedes has not yet won at in the hybrid era. It should prove to be exciting. RWhether you’re part of #TeamLH, a fan of British drivers, you admire him, dislike him, or despise him, you’ve got to give credit where it’s due for Lewis Hamilton’s fan service, not just on Sunday, but all weekend. He stayed for ages in the fan zone signing merchandise and taking selfies. His lap of honour after winning, getting as close as possible to the grandstands was admirable, as well as his crowd-surfing after the race. I’m in the ‘admire’ camp. I don’t have Petronas-branded clothing, but I don’t find it boring when he wins either. 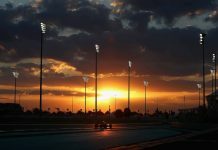 Lewis Hamilton is a very complicated figure – he’s not bigger than his sport, but as Eddie Jordan asserted on Sunday, he’s got a sort of Valentino Rossi-style following. And this is something he’s all-too aware of. The crowds in Northamptonshire adored him, and he gave something back – including a rather splendid selfie with our own Sarah Merritt. He might be a polarising chap, but you have to feel that a lot of the 140,000-strong crowd were there to see the Champ win. Before this year, Hamilton had won the British Grand Prix in 2008, 2014 and 2015; his three Championship years. Whether or not it’s a guarantee that he will win the title in November remains to be seen, but for the crowd on Sunday, he might as well have been crowned there and then. Sixteen Year-Old Makes F1 Test Debut For Lotus.